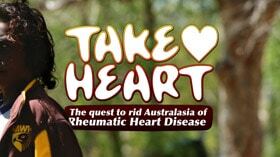 Take Heart: The Quest to Rid the World of Rheumatic Heart Disease lifts the lid on this life-threatening disease that is 100% preventable. What disease starts as a sore throat in children and ends with open heart surgery, heart failure, stroke, and premature death? “My legs started to swell, and the rate of my heart was going up, and it was really pumping,” reports teenage Carlisa who is living with RHD in the Northern Territory of Australia . “When I was around 10 years old, I tried to stand up to go get something, but my legs just fell to the ground,” recalls Melesui, a 17 year-old living with Rhuematic Fever in Auckland, New Zealand. “I don’t want to see how the kids get rheumatic heart disease,” states Liddywoo from Darwin, who has has three open-heart surgeries related to RHD. Rheumatic Heart Disease was once wide-spread in all children across Australia and New Zealand. Now, it is almost exclusively found among young indigenous Australian, M ā ori, and Pacific Islanders. ” How come it’s coming here instead of down south?” questions James, the father of 7 year-old Brooklyn who has recently been diagnosed with rheumatic Heart Disease. “There’s a number of important factors. One of the reasons is the housing,” replies Brooklyn’s paediatric cardiologist Dr Bo Remenyi. “How many people do you end up with in this house?” asks director Mike Hill as he films Liddywoo’s 2 bedroom house. “Ten, especially the bedroom and this room. Five here, five there,” replies Liddywoo. “We’ve got four girls in one bedroom, me and my husband in the other bedroom, and the boys in the lounge. This is where Melesui got the rheumatic fever,” reports Melesiu’s mother Veisinia. The lives of almost 2% of indigenous Australian, Maori, and Pacific Islanders are threatened by RHD. “My uncle died from rheumatic heart disease, and my other uncle died from it, too, and my mum,” Carlisa confides. “How do you feel about having your surgery?” asks Associate Professor Andrew Steer. “He could have died at any time if we had waited any longer,” states Associate Professor Yves d’Udekem. “The cost in life years, the cost to a family, is big, but it’s preventable; it doesn’t have to be this way,” implores Dr David Jansen. “Sometime I talk to myself: ‘Did I done the wrong thing? '” asks James. “If we could eliminate Group A Streptococcus, there would be no rheumatic fever,” reflects Associate Professor Nigel Wilson. ” I think this is critical to raise awareness, both in the community level but also the national level, to create will to put this disease in the history books in Australia and in the rest of the world.” Dr Bo Remenyi. Learn more about the Take Heart Project on the ‘About’ page. Sign Up to keep up to date with all the latest project information and short films as they release. Tweet it out ‘Share the #takehearttv trailer and be part of the solution to end RHD.